Have you ever wondered how to bake a shaped cake inside a cupcake or cake? It’s actually a lot easier than you think. With Valentine’s Day right around the corner, it’s time to get baking some special Valentine’s Day Cupcakes for your kiddos and sweetie! Aren’t they adorable? 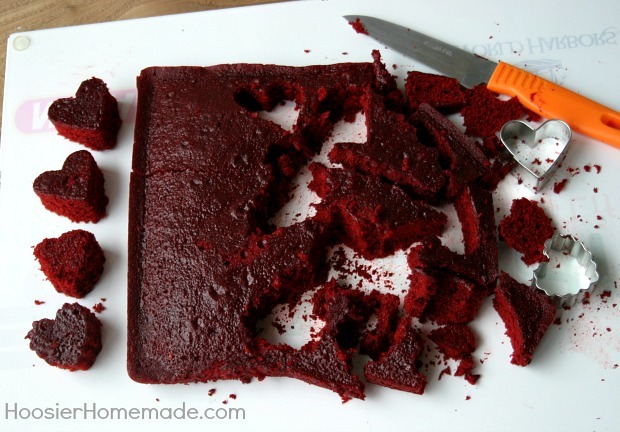 The hearts are cut from Red Velvet Cake, but you can certainly make pink hearts if you choose. I used the Wilton Mini Romance Cookie Cutter set, it comes with six different cutters including two hearts. Let’s chat about how to bake a heart in a cupcake. They aren’t difficult, but they did take some time and a little experimenting to figure it all out. After the cake cools, wrap it in plastic for a day or overnight, it will keep it moist. You can also place the cake in the fridge or freezer for a couple hours. This step will keep the cake moist since it will be baked twice. After the cupcake is filled, before you place it in the oven, you MAY want to insert a couple toothpicks. The reason I did this was so that I could remember which direction the heart was facing so when I cut the cupcake, the heart would show. You can certainly skip this step if you don’t need to know where the heart is at. Before you frost, you will want to remove the toothpicks BUT before you do, you need to mark where they are. We placed a napkin on a plate, laid the toothpicks flat on the plate to the side of the cupcake where the toothpicks are. Then remove the toothpicks and frost, being careful not to move the cupcake. Oh and let’s not forget about the divine frosting! I whipped up some heavy cream, and folded in a few heaping tablespoons of the Pink Lemonade Pie filling…YUM! 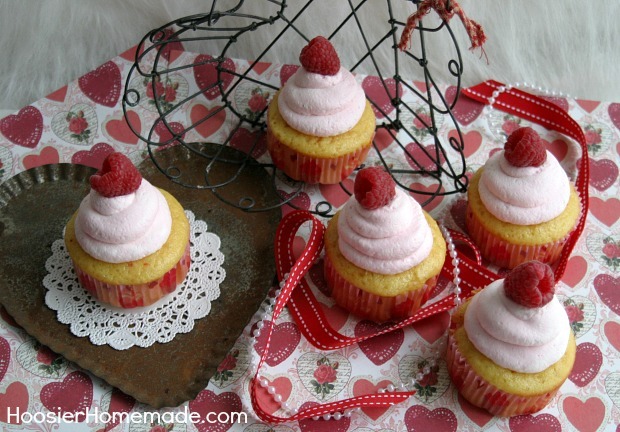 Pipe on the frosting with a Giant Round Tip, top with a fresh raspberry and you have a VERY special cupcake for your Valentine! Under bake the cake a bit, you want it nice and moist, just until it’s firm to the touch. 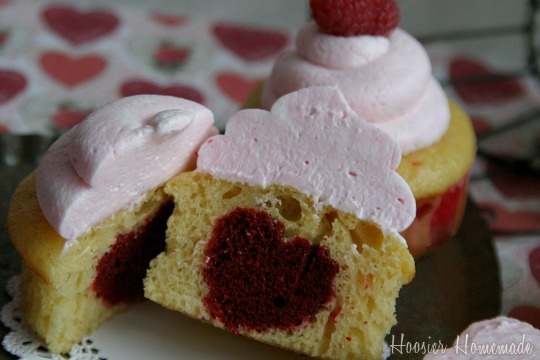 Add a heart to the cupcake liner, place it upright with the bottom of the heart on the bottom. After the cupcake is filled, before you place it in the oven, you may want to insert a couple toothpicks. The reason I did this was so that I could remember which direction the heart was facing so when I cut the cupcake, the heart would show. I enjoyed the tutorial on how to bake a heart in a cupcake. I got a chuckle from the first photo! I have the exact same heart shaped wire basket! Hi Tavette, the reason to wrap the cake and let it set is to make sure it’s moist and easy to work with. You can also place it in the fridge or freezer for a couple hours and then work with it. These cupcakes are beautiful! 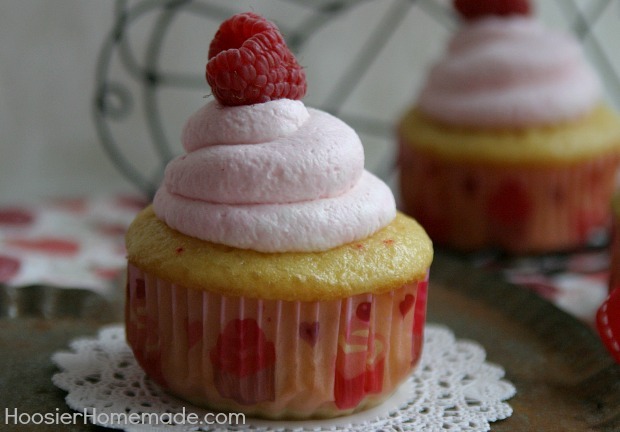 The frosting and raspberry make them look so special on the outside and then a treasure on the inside. I don’t mean to be difficult but why go through all the steps with the toothpicks? 🙂 Seems like a lot of work. Hi Pat, you can certainly not use the toothpicks. I just used them so I could tell where the heart would be lined up when I frosted them and cut into them. 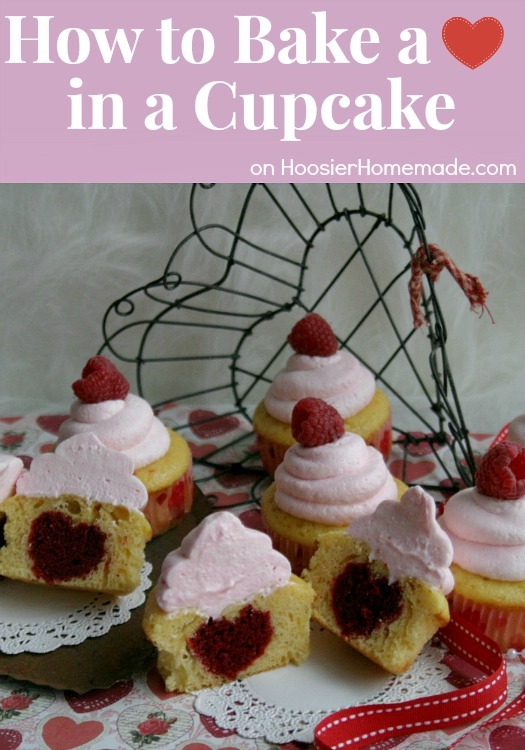 I love the heart center… the pink lemonade frosting and raspberry make it perfect! Your cupcakes are so pretty! Thank you for the instructions and hosting. That’s a seriously adorable idea! Those are beautiful! What a neat idea!! It is so neat how you put that heart inside! Love it! Thanks for hosting! Have a Sweet week!